Interesting, I've seen purple Asian types, but I hadn't seen a purple African type before (though I had read about it). They seem to cook it with the skin, and in some cases even eat the skin. I had thought the skin was inedible. Also, to clarify something said earlier, Grower Jim hasn't been contacted (just referenced), the contact is someone else. As for Jim, he doesn't seem to sell bulbifera on his site, but he might be worth trying. Well, my D. pentaphylla bulbils finally arrived in the mail and I am thoroughly satisfied. I'm obviously still concerned (it's not safe until I see some proper new growth), but they arrived very well packaged and in excellent condition, sprouted and alive! They still don't have leaves, but the very fuzzy stem (a characteristic of their subgenus) indicates that they are in-fact the real deal. I recommend this seller, they were helpful when contacted and they've sent a good product. They said that they don't eat the bulbils (no confirmation of toxicity), but that the tuber is eaten steamed. One of the slips had fallen off the bulbil, and I accidentally knocked off a second one (with very little effort) but the third was intact. The two slips were treated with rooting hormone to give them an extra boost, and all three of them (plus the now-soft slipless bulbils) were temporarily planted in a tall-ish pot, completely covering the shoots with soil to allow them to acclimate to the local humidity. If bulbil production is low this season, I'll probably just propagate them, but if there's a surplus, I'll add it to my stock. In other news, the Elephant-foot Yam bulblets (Amorphophallus paeoniifolius) arrived a couple of days ago, and I planted them in small pots to fully sprout them. I have been soaking the Ensete ventricosum seeds since Friday (changing the water mornings and evenings), and planted one yesterday; I'll keep soaking them until this Friday (following the example of another person who had success with them), planting out one seed per day in the meantime, to hedge my bets against the possibility of excessive soaking. And finally, my Ube is resprouting from the stump, so it looks like that was the way to go! Once it starts growing a little more vigorously again, I'll plant it back in the tote where I had it in the first place, next to the Florido yam. You need to send him a whatsapp message, cause they are not on the website(mobile number is on the bottom). I paid 31 usd for 5 small bulbils and 1 big sent in 2 packages. Sent in one package was around 20 usd, but the big one is going to attract more attention so I preferred to ship it separately. Any idea what this could be? Bought it at a farmers market. White flesh. I was told maybe a Mountain yam but I havnt had them before. I can take more pictures when it grows full leaves. Thank you very much! I have contacted them and am in the process of placing an order. Was the root large or rather small? I'm finding it hard to place with what I'm seeing, but I have a suspicion that it might be D. esculenta ("S" twist, prickly stem, alternating mature leaves, potato-like clusters of tubers at harvest). The prickles reminded me of my D. rotundata, but the leaves and stem look different. "Mountain Yam" should refer to the three temperate climate species (polystachya, japonica, hamiltonii), but common names aren't always trustworthy, and the anatomy in the photos contradicts all three of those. D. nummularia has a prickly base, but also paired mature leaves and a "Z" twist, so I'm not sure; the twist isn't visible in this photo, and the leaves are from the stem base, so their current configuration might not be reliable. For now, it might be an esculenta. By all means, keep the photos coming, I'm very intrigued. Potatoes! I've tried to grow the store-bought yellow potatoes for years, but even if I chit them, they always rot. I tried a red-skinned and a blue-skinned tuber a few weeks ago, and I finally have a healthy-growing plant in the Florido tub! I don't expect heavy yields, but I'll be satisfied if I get anything. Regarding the experiment, I posted about it in another forum, but I placed a request for several diploid potatoes (Skagit Valley Gold, DTO-2, DTO-28, RN27.01 and M6) to the US National Plant Germplasm System, and they're preparing the in-vitro plants to ship to me (plus some S. cardiophyllum & S. ehrenbergii seeds for good measure). I'll be using them to breed potatoes for the tropics (SVG is disease resistant and maybe heat tolerant, the DTO's are heat tolerant, the RN is purplish-red and super-high in antioxidants, and M6 is a toxic but self-fertile S. chacoense - and if I use it as the pollen parent, there should be no concern of cytoplasmic male sterility; the other two will be bred separately as another edible potato species, although I will be mixing some with the rest of my Phurejas). Finally, my Hodgsonia macrocarpa seeds arrived, and I've planted them in their own tub (I'll give them their own post of they sprout), with the newly finished trellis! They'll be sharing that trellis with the D. polystachya (I found a survivor! ), and possibly with the newer yams. Potatoes! I've tried to grow the store-bought yellow potatoes for years. Very strange, for me they sprout even from some small peel in the compost. If you let the potato sit at room temperature without soil it will start to sprout by itself, they really need no care. Where did you get your Hodgsonia? I have some seeds coming from Roy-Ind. Sprouting the potatoes has never been a problem for me, even the yellow ones. But regardless of whether I planted them sprouted or not, they would always end up rotting. I think it might be the heat. The red ones are said to grow better here anyway. My Hodgsonia was from Roy as well. I hope to get at least one male and one female to flowering age, otherwise I'll neither be able to taste nor multiply them (the latter being more important than the former, for now). Did my purple yam post start you down this road? It was a catalyst. I had already decided on acquiring the Ube, and I was already reviewing my yam collection at the moment and looking over the literature, but your post reminded me, so I went to eBay in search of it. And that was all it took... First the Ube, then I went in search of the rest. So thank you! I was also reviewing staple crops and have been checking out perennials in the permaculture literature, thus my emphasis on the Air Potato. And in one such article (link here), they also mentioned Mesquite as a highly productive perennial staple. Furthermore, in the comments of a separate article (link here), they mentioned Prosopis pallida, P. glandulosa, P. velutina, P. cineraria, and especially P. alba as being the most palatable species, with P. alba being sweeter, non-thorny, non-invasive, and being superior animal forage. Well wouldn't you know it, soon after reading this, I found Rare Palm Seeds was selling seeds of a superior selection of P. alba (link here, description here). I hope to be able to acquire seeds of it while they still have it in stock. I may have to make a separate thread for staples. I'm actually hoping to have a good set of crops to keep myself fed without depending on the supermarket (more like self-reliance than full-on survivalism). I feel the topic deserves to be explored. But for now, I'll focus on the yam collection. Planted it in a large hole and its taken off. Very nice! It still seems a bit soon to tell, but it looks like they have alternate leaves and are twining with an "S" twist. That, coupled with the spines and the very rounded leaves suggest D. esculenta. If that is the case, you should expect a potato-like cluster of tubers at harvest. Keep it coming, let's see where this goes! Well, I've got an important update, so listen up! 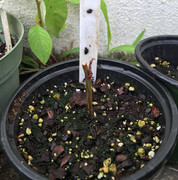 The Dioscorea from RarePalmSeeds is mislabeled. From the looks of things, they just don't know any better. As a distributor, they count on their providers to give them the proper identification on the product listed (and let's face it: D. bulbifera is one of the most misidentified Dioscorea in commerce). Having grown them out for 15 days, it's clear that the yam they're selling is NOT D. bulbifera by any means. The anatomy most closely corresponds with D. alata... And I'm almost getting sick of that species. I've received it three times by mistake from different sources, not to mention the two domestic (and one feral) varieties I was already growing deliberately. I don't need any more of these! Please label your yams properly! I have asked for a refund... Time will tell if they'll acquiesce. The last surviving Pentaphylla yam (and seemingly accurate in its ID) has died. As the tuber was rotting away before the vine died, I don't expect it to resprout. I could order more from eBay, but I get the feeling they're all in a precarious sprouted state, so I will wait for next year, in the hopes of getting them earlier, prior to sprouting. I'll be trying the same vendor again, as they packaged it properly. Where did you take yours? Mine from Ebay user goodmice also arrived rotten and the shipment was delivered in around 2 weeks, so not much. Mine was from goodmice, but they arrived in fair condition. Sprouted, but alive (though pale white). The tubers fell off from two of the three, but only one of the tubers was bad. Both tubers rotted away. The good tuber on the plant that kept it rotted away recently. I mishandled them: I thought they required acclimation to local humidity levels, so I buried them deeply. All that did was cut off their sunlight and prevent their growth past soil level. When I realized they wouldn't come up, only the one with the tuber remained, and i dug it up and buried it near the surface, with an exposed new sprout. The sprout ultimately failed to green up and grow. It's dead now. Of the three D. pseudo-tomentosa, only one bore roots, the other two rotted. And this rooted one has failed to sprout past soil level, so I'm concerned as well. Last time I dug down to it about a week ago, it seemed to have living roots, so I left it alone again. Time will tell. The Elephant yam is called Suran in india and is available seasonally here in the USA from larger Indian grocery stores. My local grocer said he could order it for me but I would have to pay in advance. Really? I thought they weren't really sold commercially in the west. They may be called yams, but given their family I suspect they're probably closer to Cocoyams in culinary qualities. How long does it take from small size to a reasonable harvest? Yes, the store owner said they did get shipped in from India. Interesting. I had thought that they required moist soil, but they seem to do fine under mesic conditions, maybe irrigation under drier conditions. I wonder if they'd be marketable here in Puerto Rico. We're big on yams, but new stuff can be a challenge to introduce to a reluctant populace, even if it seemingly is good. Thanks for the vids! I look forward to tasting mine 9 months down the road. I certainly hope mine are decent, they were marketed as edible by the eBay seller (from Florida). Wow - very informative posts and a lot of hard work you are doing - thanks. I'm in Mexico and have bought from Las Cañadas. Unfortunately, it takes about 2 weeks for a purchase to reach me because I'm in a somewhat isolated region. Forwarding to you after that would be hard on any product. You could try to contact raulglezruiz who is in Puerto Vallarta and may get things a little faster. I wasn't too impressed with the Las Cañadas packaging either. Everything just wrapped in newspaper so all the plants had dried leaves and stems. I bought the only varieties they were selling - Camote Beauregard which they only sold as a plant and bulbils of what they call 'Papas Voladora' which came as dried up bulbils. Not sure if this is the one you want. If mine survives and you don't find it elsewhere, I can send you some when they are ready. I've only just begun growing sweet potatoes/yams - until now all from store-bought produce. Some seem much more productive than other but that may be due to the different parts of the garden I planted them in. I'll be comparing them growing in the same area this year. I've also been impressed with the way the plants make good ground cover and spread if you don't put them on a trellis. I'm a little nervous about those Papas Voladoras as they are considered an invasive plant in many regions. They sound like hard work to control. Potatoes have been a challenge for me too. Again using store-bought potatoes for seed. This year I bought some of the Las Cañadas Papas Criollo to try. Previously my plants have been fairly large but produced few potatoes and didn't flower very much. Last year I got a reasonable crop but I'm not sure why. I planted them later than usual, in November/December when it is a bit cooler but my soil is also improving each year from the original wasteland it was. Then of course there is the question of variety. I haven't yet figured out how to preserve the potential seed for the next year so don't have any to plant this year. Here is a 'groundcover' sweet potato I just cleaned up to prepare for this year's planting. Papa Voladora, that's the one! An African bulbifera, and different than the one I'm getting from South Africa (which is rounder; the one in Las Cañadas seems flatter, maybe more angular). I'm looking to get every edible strain of this species that I can find. Keep me posted on yours, I'm looking forward to seeing how they grow. As for invasiveness, I don't think there's much cause for concern. The edible types aren't supposed to be as weedy or as vigorous as the toxic types. While I can confirm that all the little bulbils that fell off my vine sprouted where they landed, they were easy to find and pluck or mow down, and none re-sprouted; no survivors. I'm hoping to capitalize on the ground-covering skills of the sweet potatoes myself, to keep the weeds down. I gotta finish getting rid of the Guinea grass, but after that I'm getting my slips started. I actually found a YouTube video where the guy gets them growing from small pieces of peel! Kitchen scraps! I knew you could grow some Dioscoreas that way, but I never figured it'd work for sweet potatoes. Link here. Papa Criolla sound like a Phureja type, they should be able to take the heat better. Store-bought potatoes don't tuberize well above 85 F, if I remember correctly. Mine already started tuberizing (I had to pile on more soil), but I don't expect much, the summer heat's not quite gone. I haven't sown the Cimatli seeds yet, and the in-vitro clones were a disaster. A few survivors from two varieties, and I don't expect them to last much longer. Like potato seedlings, they all succumbed to damping off. I'm not sure when I'll try again, but I already have ideas to offset the effects of humidity (if the rain lets me; the air was humid even under the roof). My african bulbifera arrived in super healthy condition. Buy with confidence from Stephen. Is this bump a shoot or a root? I put it downside but I'm worried it could be a shoot. Its a shoot! It may be okay if you leave it that way, but I would gently remove it and replant it face up. Very awesome! I just recently found what I think is a mountain yam. I will post some pictures once it grows a little more. Thanks, I reoriented all the one that sprouted. What's a mountain yam? scientific name?